my friend said as we tried to swat one that kept buzzing around our heads. “Then God saw everything that He had made, and indeed it was very good “ I said, quoting Genesis 1:31. However, even though I always tried to look for good in everything, I secretly had to agree with my friend that flies really didn’t seem to be much good for anything except annoyance and germ spreading. Later that day, I happened to began thinking about flies again and I decided to see if there was anything good about them. After all, a creation of God has to have some good, some purpose, some redeeming quality. 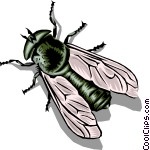 So, I decided to look up “Flies” in the online search engine to see what they were good for and this is what I found. I learned that male flies are important pollinators because they dine only on plant nectar and sap which they get ,in part. from early spring wildflowers. They pollinate as they go and Black flies may even be pollinators of our blueberries. In fact, only bees and some wasps pollinate more plants and flowers than male flies…interesting…I guess those guys do some good after all! Another good quality I found was that Black flies are a good source of food for other wildlife, like bats, fish, spiders, dragonflies, swallows and crows. In fact, one crow could eat 16 bushels of them in one year! Ok, let’s hear it for the crows ! They are some fly catchers ! Also, flies act as scavengers and recyclers by feeding on decaying waste and that is definitely a good thing. So, I found that flies are indeed beneficial and necessary in the right places or at the right times. It’s just that when they are being annoying by buzzing around your head or crawling all over your food and perhaps spreading germs, that it’s hard to see any good in them. The same could be said about all of us at times, I guess. We all have our good and bad qualities, sometimes the good outweighs the bad or vice versa, yet if we take the time to search for it, good can be found in everything and everyone. Tip: I also read that flies take off backwards, not sure if that is true but that might explain how they seem to almost disappear before our eyes or why it is often so hard to swat them.